This multigem diamond 18ct white gold ring was designed to incorporate varying size stones from several old family rings. 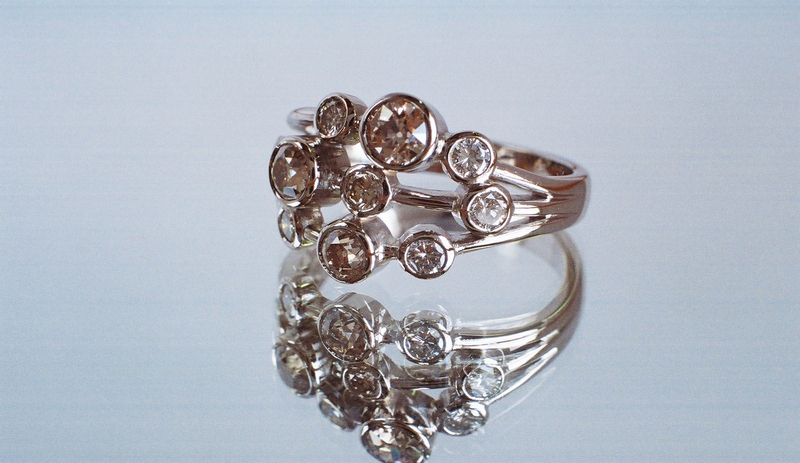 Recycling the gems helped create a ‘stacking’ style ring with a contemporary feel giving the ‘Old Cut’ diamonds a new lease of life. The white gold was left in it’s natural colour (not rhodium plate), this worked sympathetically with the tinted antique appearance of the diamonds. Diamonds were carefully arranged in a random pattern, individually mounted in rubover settings. A new family classic.